The last time I was in for a physical, my doctor said that he was concerned about my weight. Now, I know that the Body Mass Index is a load of s*** since your weight relative to your height doesn’t take into account muscles mass or body fat percentage, but still, when a doctor says something like that, you tend to take issue. I’m about six feet tall and at the time just over…never mind…leave me alone, my daughter was just born and I was eating a lot of homemade cookies. Regardless, I was a little heavier than I would like to be, like say, about 20 pounds above my preferred weight class, still a long way from obese. Anyway, my doctor said that he was concerned at the year to year fluctuations in my weight. I looked at the dates of my physicals. One, showing me twenty pounds lighter about three years earlier was literally a day before a competition, the next year, about 15 pounds heavier was about a week after a competition. Doctors get these far away, confused look when you mention weight cutting. Not that I'm an expert by any means, but doctor's sure as hell don't know anything about weight cutting. Unfortunately, neither do many clothing companies. I’ve owned more than a few board shorts for grappling over the years and one thing that many have in common is a rigid waistband, by which I mean there is no give. So the shorts you train in between competitions probably don’t fit as well as when they do right before you compete. Or vice versa. 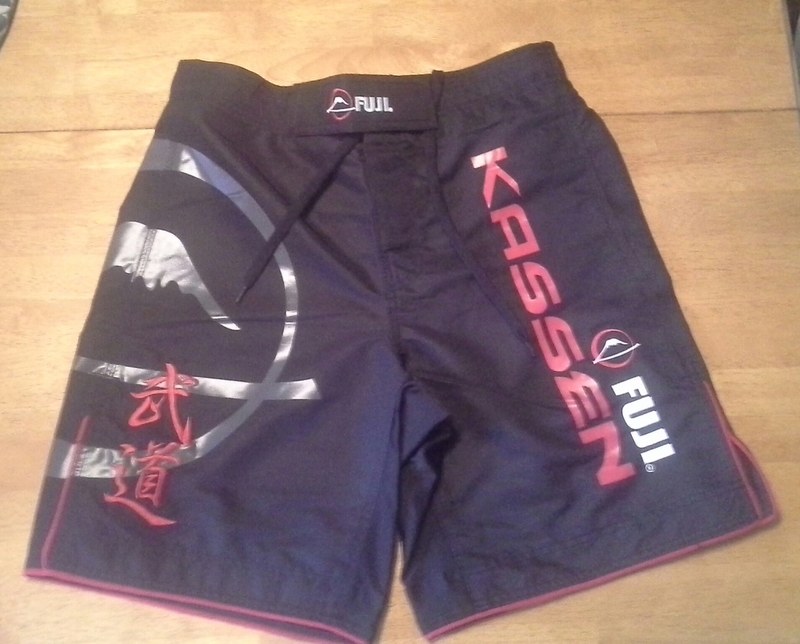 Then there is Fuji Sports Kassen board shorts. The beauty of these shorts is the elastic paneling at the back of the shorts. It isn’t much, but it can create I’d say as much as an inch or two of variation in waist size, which is huge for athletes who cut weight. Or grapplers with poor impulse control and new children. I want my shorts to feel comfortable every day, not just days when I could say no to pizza. Additionally, the shorts have a side split seem to offer added range of motion, which is great for days when you are working triangles, or lets face it, anything else in jiu-jitsu. Even the inner thigh panels have some added give to assist in range of motion…or to help me defend against my banana split submission nemesis. Then there is the combination of Velcro and drawstring closures. Some shorts only have a small patch of Velcro that can easily wear out over time, but Kassan shorts have longer vertical and horizontal Velcro strips to help reinforce the drawstring closure. If you need a cherry on top (or three), the shorts are also sweat repellent, antimicrobial and have reinforced stitching. This is a game of years, not days. Personally, I don’t want to have to spend a ton of money replacing gear when I can make one purchase that I know will last me hour after hour after hour on the mats. Available in sizes 28-44, if there is one thing about these shorts that makes me even a little bitter, it’s that I didn’t know about them sooner.